Glasgow has a history of radical women. When 8,000 more of them strike this week to demand equal pay for council-employed carers, cleaners, caterers and support workers, they will join a proud tradition of Glaswegian women making their voices heard and pulling together collectively in pursuit of what is just and fair. In 1915, Govan’s Mary Barbour led around 20,000 people in rent strikes when landlords raised rent to capitalise on an influx of WW1 munitions workers and shipbuilders. Her direct action resulted in rent controls being imposed by the government, and a statue of her stands today at Govan Cross. In 1943, in the midst of another war, Glasgow’s women munitions workers took part in history’s biggest equal pay strike, when an estimated 16,000 walked out and secured a new pay agreement as a result. Today’s equal pay women collectively make up the biggest peacetime equal pay strike the country has ever seen, and they will be similarly vindicated. The battle they’ve been fighting for the past twelve years isn’t an easy one, though. Across Scotland and the UK (and indeed the world), equal pay remains a pipe dream for many women despite being guaranteed in law since 1970. The reasons for this are many and could constitute a whole article in themselves: pay grading and structures are off-puttingly complicated and opaque for one, and historical worker-led activism has traditionally favoured men. But perhaps most infuriatingly, the types of jobs that have been coded as ‘women’s work’ – jobs like cooking, cleaning and caring – have simply always been seen, oxymoronically, as both jobs we should do regardless of pay because they are so inherent to our nature, and jobs so lowly and invisible they don’t warrant any further attention. A conversation around equal pay has reemerged in the UK in recent years as feminism becomes increasingly fashionable and marketable. But because these are the parameters in which the conversation has happened, it has focused mostly on white, middle-class women with visible roles: women like the BBC’s Carrie Gracie, who remains the only equal pay claimant that many of us could name if asked on the spot. Her fight for equal pay was brave and important, and she consistently used the platform it gave her to turn a spotlight onto other equal pay battles bubbling away under the surface. But in spite of her efforts, many rage on under the radar, at a level of society easily invisible to those who don’t need to look at it. Not only are Glasgow’s women fighting in a national and historical context in which working-class women are forced to shout twice as loud to be heard, but the local context in which their battle takes place – and the reactions to it – provide yet another obstacle for them to overcome. The facts of their case are, in summary, this: the dispute began in 2006 under a Labour-run council when a new pay scheme designed to eradicate unequal pay actually ended up entrenching it. For years, the Labour-run Glasgow city council fought equal pay claims in courts and tribunals – where equal pay claimants repeatedly won – until the SNP took control of the council in 2017 on a promise of ending litigation and settling equal pay claims. Unison didn’t sign off on the original pay scheme and has taken strike action on multiple occasions over different elements of pay and grading relating to equal pay. The GMB union, which hasn’t taken strike action until now, didn’t sign off either but had been plagued with accusations of protecting male members’ interests and pressuring women to settle. Twelve years on from the original pay scheme, many of those involved in the unions have changed, and our understanding of equal pay and respect for the rights of women workers has started to improve more widely. 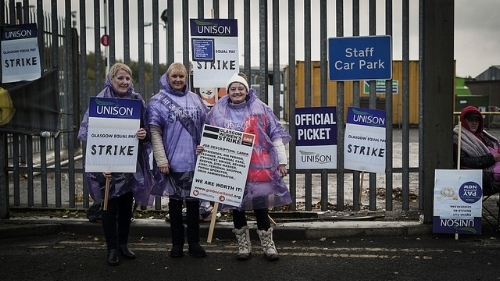 Both unions say negotiations have failed and that members have called for strike action as a last resort. Those are the facts. And like all facts, they can spawn many analyses and lead to a thousand conclusions. Among the most cynical of these are this is all political strategising against an ostensibly cooperative SNP council. Among the most offensive are that Glasgow’s bold, brave, working women are being used as vacuous pawns in the political ambitions of union officials. As a feminist and a socialist, I acknowledge all of the above facts and come to a different conclusion: that Labour’s treatment of these women was scandalous; that the SNP came to power on a set of good promises about this; that I believe workers at their word when they say negotiations have failed and that they see industrial action as their only option. On a personal level, I’ve spent time with many of these women in the process of reporting this dispute and I defy anyone to speak to them for longer than a minute and believe that such smart, principled activists would ever be duped in a political chess game. Not to mention the ‘useful idiots’ trope is also not one I’ve ever seen anyone brave enough to direct at male strikers. None of this is to say unions are beyond reproach or that “all politicians are the same”. In this case, the male-dominated and male-oriented GMB of 2006 clearly let its members down, and many elected SNP officials – the feminist credentials of whom I don’t doubt for a second – now find themselves in an unenviable and impossible position. Rather, it’s to say the answer to why strike action of this scale was never called previously is more about societal power and its distribution than it is party political power and its gatekeepers. You only need to glance at the scaremongering coverage of striking women leaving vulnerable people at death’s door to understand the emotional blackmail placed on the shoulders of already heavily-burdened women when they threaten direct action. In their position, it might take many of us a decade to feel powerful and worthy enough to strike too. In fact, this discourse around Glasgow’s equal pay strikes highlights some of the greatest threats to workers’ solidarity in general. The accusation of political manoeuvring on the part of trade unions is an age-old – and right-wing – trope which has been used to discredit direct action by workers for as long as it has existed. The creation in the public imagination of the single entity ‘the unions’, rather than a dynamic and constantly evolving mass of activists, branches, officials and policy, works in its favour. And, perhaps most crucially of all in this case, the framing of these disputes as political interest versus political interest rather than workers versus state power can only operate to splinter and erode solidarity among a left which should be firmly united behind the former. It’s for this reason we shouldn’t waver in our support of industrial action, no matter the circumstances, demands, historical context or stakeholders. Dignity, respect and equality are not bonuses that bosses – no matter how ostensibly reasonable or kind, no matter what political party they might be from – will hand down voluntarily with a shiny bow on top, because they are simply not built into capitalist structures of work. They have to be fought for, from below, against all the odds and by asserting our worth, just as Glasgow’s women have done for the decades in which they’ve kept up this fight, and just as they are doing now by choosing to escalate it at this point. If this is an essay about the context in which Glasgow’s equal pay strikes are taking place – historical, political, national and local – it’s also worth taking a minute to think about the future. It may be true, as Glasgow City Council have said in response, this strike will make no difference to negotiations – that, after all, is largely up to them. But it’s not true it will make no difference at all: 8,000 politicised, angry women who know their rights have been shown their voices matter and their hard, emotional, undervalued work is worth something, and they aren’t going anywhere. Many more thousands will have watched them from near and far, and started to think they might matter too. And once they’ve won, society can’t carry on with the business as usual of subsidising whole cities on the funds they’ve stolen from downtrodden women, or taking for granted that they will dutifully do the work the rest of us don’t want to, quietly and at great discount. When Glasgow’s women have taken their rightful place in the history books for spearheading this monumental change, the narrative around them will be one of workers’ rights and women’s liberation. For now, they do as we do, and they battle diligently despite accusations of political infighting, overstating their worth and being silly gormless women, because they know that what they’re asking for is the least that they deserve. This city’s working-class women haven’t been wrong yet. All pictures are PSI Creative Commons. Video, shot and edited by Jonathan Rimmer, belongs to Conter.